Der Spiegel reports that German Chancellor Angela Merkel warned David Cameron at last month’s EU summit that she would no longer try to keep the UK in the EU if Cameron sought to impose quotas or a cap on workers from other EU countries, as opposed to changing the rules around EU migrants’ access to benefits. 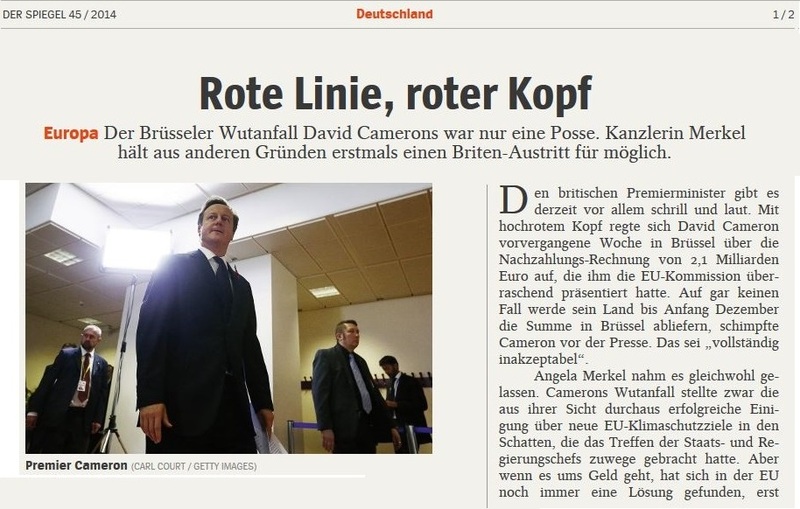 The magazine also reported that the German Chancellery and Foreign Ministry fear that, for the first time, Cameron is pushing the UK towards a “point of no return” in terms of its EU membership and that a UK exit is “possible”. But there’s no reason to be get overly excited though. This was a report from one magazine which didn’t include any direct quotes from Merkel, but merely quoted unnamed sources. Moreover, as Sky News‘ Faisal Islam points out, the report isn’t exactly front page either… its on page 36 of the print edition. The reported comments were specifically about reports in the UK media about Number 10 possibly considering putting outright caps on the number of EU migrants who can come to Britain to work, either via quotas or a points-based system. So one speculative media report leading to another. As we’ve argued repeatedly, there are two elements to free movement: volume – how many EU migrants come to the UK every year. And fairness: who can access what benefits and when. That Merkel doesn’t support an end to the basic right for EU migrants to come to the UK to work isn’t surprising at all. It’s been the German government position for ages. Stefan Seibert, Merkel’s spokesperson this morning re-stated Germany’s commitment to “the general principle of free movement”. However, within that there’s a lot of scope for change and plenty of EU reforms that could fly in Berlin. Remember, the Bundestag will this week vote on a number of proposals aimed at tightening EU migrants’ access to benefits, including re-entry bans for those migrants that abuse of the German welfare system. The “job offer” part is interesting – the right to move to another EU country without a specific job offer hasn’t always been there. However, note there’s nothing about a cap – what the Der Spiegel report was about. There’s the point about wider “impact” but, again, the main focal point is benefits. Which may suggest that No 10 remains primarily committed to looking at “fairness” – not actually ending free movement per se. So only tweaks then? Not at all. Open Europe has today published a new pamphlet by Professor Damian Chalmers and Open Europe Research Director Stephen Booth which argues that the basic right to go and work anywhere in the EU should stand – on the whole, free movement remains a clear benefit to the UK. However, national governments should be able to limit EU migrants’ access to out-of-work and in-work benefits, social housing and publicly funded apprenticeships until after three years. Incidentally, Der Spiegel did not claim that Merkel was now ‘ready to accept’ the UK exiting the EU, as some UK media outlets have reported. Instead, she now considers Brexit “möglich”, which translates as “possible”, which is more along the lines that it is something she fears. In other words, whilst certainly a strong indicator of the mood music in Germany and the UK, on specific substance, this is much less of a story than the headlines suggest.